The conspiracy to kill Hitler. I’ve always been quite interested in WWII history, and after stumbling across Black Orchestra, was drawn in by the combination of historical accuracy and distinctive graphic design. 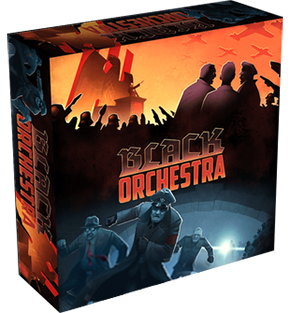 This co-operative game puts you in the shoes of one of the historical conspirators who plotted to assassinate Hitler. It treats the challenging subject with due historical respect and is educational as well as enjoyable to play (from what I’ve read of the rules – I haven’t got my copy yet). After expressing my interest in the game on Boardgamegeek, Cody Jones of Game Salute was kind enough to contact me and ask me to create one of my rules summaries. So now those backers who funded the second edition on Kickstarter will get a printed copy of this rules summary and reference in the box. Finally got my copy of the second edition in the post; it’s a beautiful game, with clear rules and tons of historical theme, and it’s great seeing an EOG rules summary/reference in the box. Thanks mate. Looking forward to getting and playing my copy! When I opened the box, I thought to myself, “That cheat sheet is eerily similar to one of Universal Head’s. Did they make this in homage?” And now I see it’s an official UH/EOG cheat sheet. Well done!